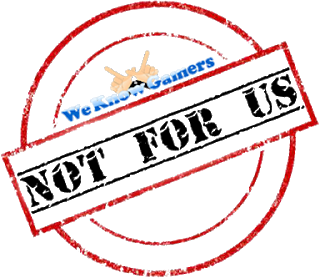 Home » Farming Simulator 2019 » GIANTS Software » ps4reviews » Farming Simulator 2019 Review - Old McDonald's Time To Shine? Farming Simulator 2019 Review - Old McDonald's Time To Shine? Farming Simulator is back for 2019, and with it, the acquisition of the John Deere brand. This is big news for Farming Simulator, but it takes more than a brand to make a game great....or does it? Having never played a Farming Simulator title before I didn't entirely know what to expect. In a world full of "Simulators", it's becomingly increasingly difficult to tell what's serious and what's not. That is, until you get a hands on. So, I'll start right away by saying if you're looking for a silly, fun and ridiculous simulation title such as Surgeon Simulator or Goat Simulator, you may as well stop reading now. This isn't that game. Serving as an actual simulator, Farming Simulator 2019 goes to great lengths to teach you the ins and outs of farming life. From cultivating fields, sowing crops and planting seeds, there's a lot to take in. Thankfully there are a ton of tutorials to get your head around, but even then I found the title could be a lot more user friendly. Having little to no knowledge of farming, I'm not afraid to admit I was a little clueless. There are six main menu tutorials that will cover the basics of farming. This ranges from cultivating fields, baling and even forestry work. The forestry machines were a little complicated to work, but once you get the hang of things it becomes fairly easy, if a little time consuming, but then again if you're in the market for a game of this genre, you're probably in it for the time sink. Baling is incredibly easy to carry out, with machines doing most of the work for you and not only that, when you want to move onto another something else, you can hire a member of staff to carry on the job for you. This makes managing your farm a little easier, but the catch is it all costs money, bringing to attention a fine balance between efficiency and income. Time is money after all, and everything in Farming Simulator costs money. Worth mentioning is my experience with the forestry equipment, which was interesting to say the least. The tutorial had me cutting down a marked tree with a Chainsaw and once done, I needed to slice the tree up into a number of smaller, more manageable logs. Unfortunately, smaller logs are worth little, so in came the big boy machine - An incredibly manoeuvrable machine with a highly functional cutting arm, giving you full control when needing to raise, lower and shift back and forth the mechanical arm to make that perfect tree cut. After this, you're required to jump inside the tractor next to it, which has another crane arm connected to it, this time for lifting chunks of wood that are far too heavy to carry. I found that it's always better to cut the tree just enough to make it manageable, yet it's far easier to chop it up into small chunks to manually lift and load into the back of your log transporter. At one point, I wanted to test how much I'd get for a full tree, so instead of cutting it up, I chopped it down, picked it up with the crane arm and dragged it along the road to the wood yard. At this point I couldn't work out how to sell the tree, so it may have been a simple case of you can't sell something of that size. Once I worked it out, I was mostly selling the smaller, more manageable wood anyway. Still, the bigger the load, the more cash you gain, so it was worth a try, even if the image of dragging a tree down a country road is a little absurd. To my surprise, there is a form of character creation here, but it's so lacking the developers at GIANTS Software would have been better off leaving it out entirely. What isn't lacking however, is the sheer number of vehicles (you can customise their colours) and tools available for purchase within the game and no, I don't mean with real money, just in-game currency. There are an absolute ton of vehicles to purchase, sell and upgrade to something better. There are also a load of licensed vehicles, but not having much farming knowledge myself, it's a little hard to tell if they're all officially licensed or if there are some original brand names created purely for the game. I'm going with the latter, but again it's just an educated guess. FIAT and John Deere were the two brands that stood out the most to me. 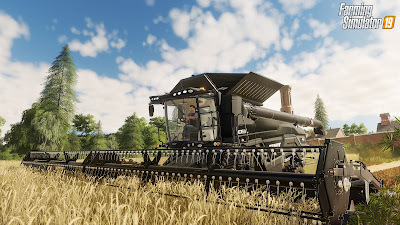 Primarily, Farming Simulator 2019 is a first person venture, switching to third person only when you enter the many vehicles of the game. You can however, switch to first person perspective while seated in the drivers cabin. This allows you to view the many switches, knobs, meters and gauges farmers would be used to seeing on a daily basis. 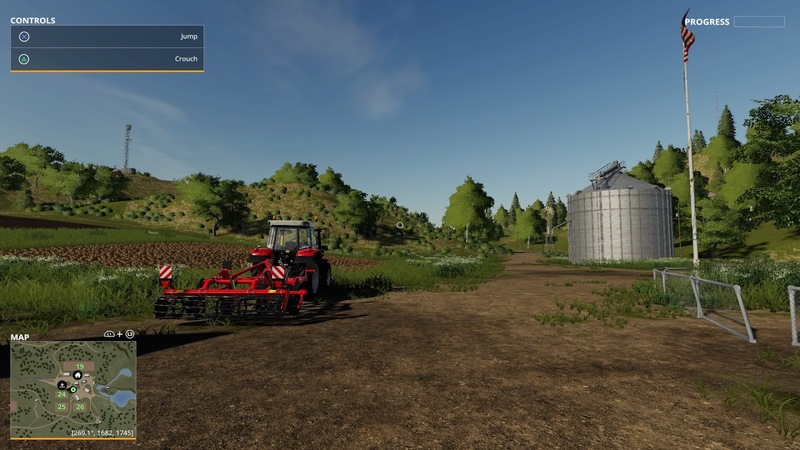 So from an educational perspective, Farming Simulator 2019 can be interesting, even for those of us completely uninterested in farming. There are a number of locations you can begin your farming career, but in general, the over-world is quite lacking. The game gives you a rather large area to work with and it really does resemble fields and farmlands of UK and Ireland, but there's simply little to no reason to explore. The farmstead itself has little going on outside of farm work and exploring the farmhouse at each location is lacklustre to say the least. Still, you don't play Farming Simulator to sip cups of tea in a farmhouse, so this is likely a moot point. I just feel interiors could be designed better, as it'd really help with the immersion in such a setting. To make in-game purchases, you can either head to a shop location or simply click the touchpad (I was playing on PS4) to access the store anywhere on the map. At the store and other locations you can find a number of ATM's to deposit, withdraw and even borrow money, though I saw little use for that and the tutorial didn't cover this. I do get the impression that when you drop into bankruptcy territory late-game that it'll be incredibly hard to clamber back out. I'd imagine borrowing money is just a way to extend your farming experience when all hope is almost lost. The graphics are pretty poor and the physics are even worse, but the latter only generally becomes problematic when you're not doing what you're supposed to. 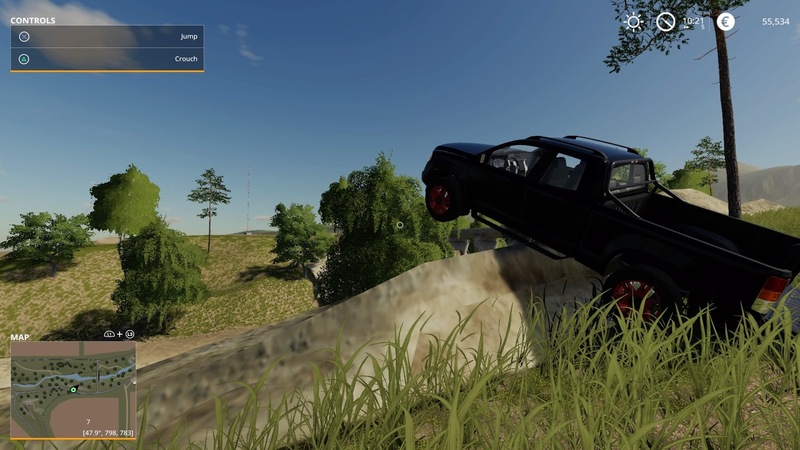 For instance, racing your newly purchased truck around, trying to get air over every mound and cliff you can find. During my mad five minutes, I found far too many invisible walls and discovered the vehicle you're in will always self-right back onto its wheels, no matter how many times it flips and bounces across the screen - that is unless you get it stuck on a rock like I did. With seemingly no way to reclaim it, it was at this point I put Farming Simulator 2019 down and began my review. Overall, I'd say that Farming Simulator 2019 is an excellent purchase for those of you wanting the full farmyard experience. It's educational, very good at what it does and though it may not have great graphics, the visuals are as good as they need to be. It also supports console (and PC) mods and online multiplayer. 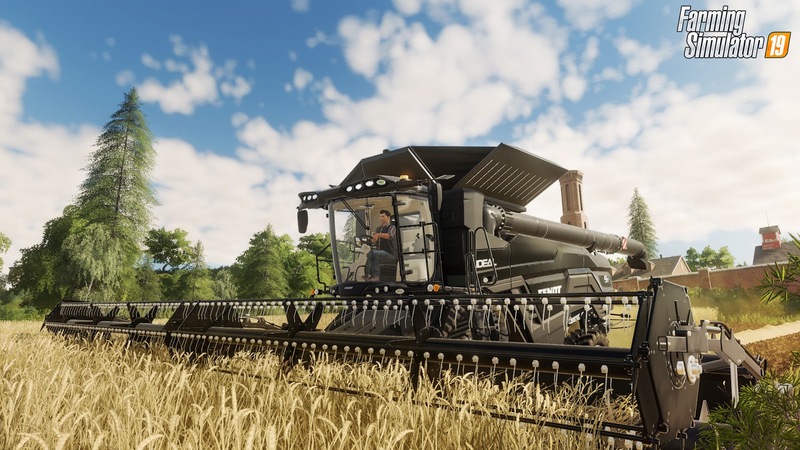 Farming Simulator 2019 is a lot like Marmite - You're either going to love it or hate it. If it's not your type of game you're going to get bored incredibly fast, but if you're interested in farming or are a fan of previous titles, this is definitely an improvement with several new and more realistic vehicle handling features. Once you get into the rhythm of things, I'd even go so far as to say Farming Simulator 2019 is somewhat therapeutic. It's just not for me. I'd like to thank KochMedia for providing me with a copy of the game on PS4, and for a fantastic day out to in York, where I had the opportunity to take part in a number of farming activities including tractor driving (and racing), animal herding and a hands-on with FS19 inside an actual log cabin. It was a great experience and one that I'll remember for years to come. Farming Simulator 2019 is out now on PC, Mac, PS4 and Xbox One.